Then-Weinberg juniors Nehaarika Mulukutla (right) and Rosalie Gambrah speak during a Daily-moderated debate in April 2017. The two will complete their term as Associated Student Government president and executive vice president next week. As Nehaarika Mulukutla was sitting in Fran’s Cafe at the beginning of her freshman year, another student approached her and asked her to sign his petition to run for an Associated Student Government Senate position. She asked him how she could get on the ballot, and decided to run herself after he sent her the information. “I actually beat him for the same position,” Mulukutla said. 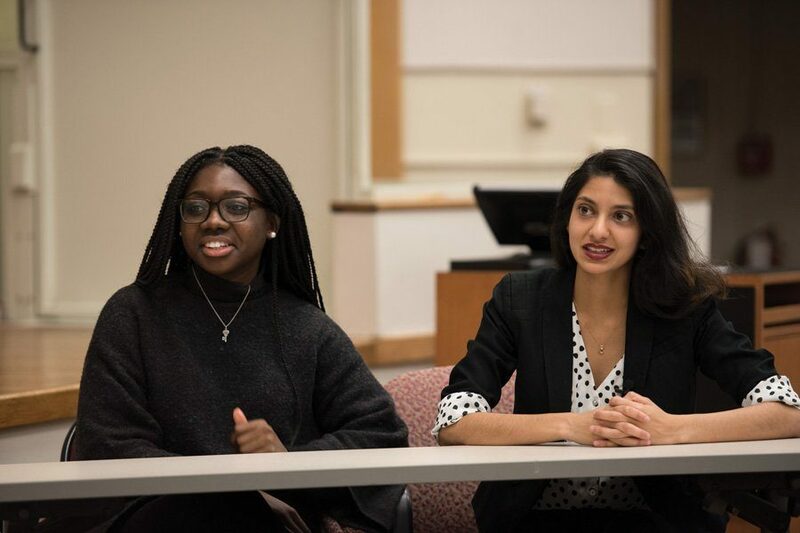 More than three years later, Mulukutla, the current ASG president, and Weinberg senior Rosalie Gambrah, the executive vice president, are nearing the last week of their term. Looking back on their time in ASG, both said they were proud of the impact they’ve made. Gambrah said she hadn’t planned to join ASG in any capacity when she got to campus, but changed her mind after attending an activities fair at the beginning of her freshman year. Mulukutla later served as speaker of the Senate, while Gambrah served as vice president for student activities. Gambrah said she hadn’t planned to run for any positions, but decided to run for the vice president role after former ASG executive vice president Macs Vinson encouraged her to consider it. Mulukutla and Gambrah began their term after winning the first uncontested ASG election in institutional memory. Economics Prof. Mark Witte, who serves as ASG’s adviser, said while the uncontested election was “disappointing,” Mulukutla was a strong candidate regardless. At the beginning of their term, Mulukutla and Gambrah asked each of their vice presidents to give them a list of term initiatives. Each person achieved at least one of their initiatives, Mulukutla said. Gambrah said the biggest thing the pair accomplished themselves was getting Center for Awareness, Response and Education training mandated for presidents and vice presidents of student groups. Those trainings will take place in the spring, she said. Mulukutla said a list of their term initiatives was open on her computer “24/7.” One initiative was student group funding reform, and Senate will vote Wednesday on a proposal that would overhaul the current system. If it passes, Mulukutla said she and Gambrah will complete a project that the last six administrations have worked on. Students’ wellness was a priority throughout their term, Mulukutla said, and they worked on ways to empower students both in and out of ASG. Mulukutla and Gambrah both said they will not endorse a presidential ticket in this year’s election, saying both candidates care about Northwestern and issues related to students. But regardless of who wins the election, Mulukutla said she hopes the next administration continues some of the policies she and Gambrah started.